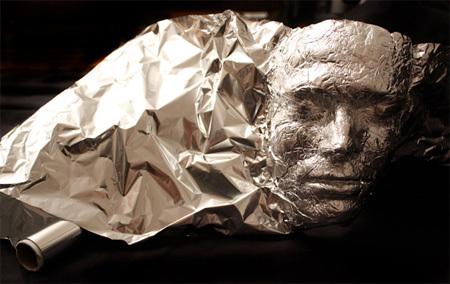 Dominic Wilcox, a talented British designer, made detailed 3D replica of his own face out of regular tin foil. Fragile sculpture was created by forming tin foil into an old plaster mold that was made when the artist was 21. I’m sorry, but this is what I can expect from toxel these days? 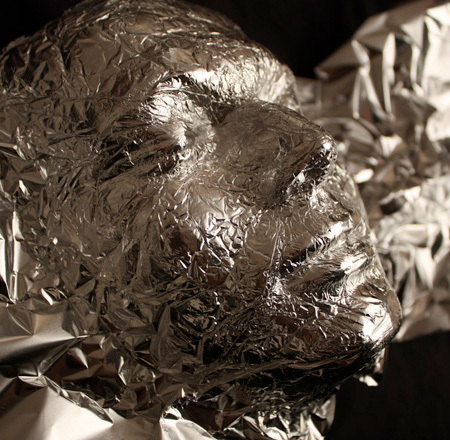 Man makes mask out of aluminum foil by forming tin foil into old plaster cast? Hey what’s up 4th grade. Long time no see. Awesome idea! I will try to make one myself. This guy teaches at kindergarten yeah? If he had cut the extra tin foil off of the sides then this wouldn’t be on this cite. Toxel needs to add “worthy” and “unworthy” buttons and let us vote on this stuff. you, sir “Truthiness”, are right! Agree with Truthiness and G! 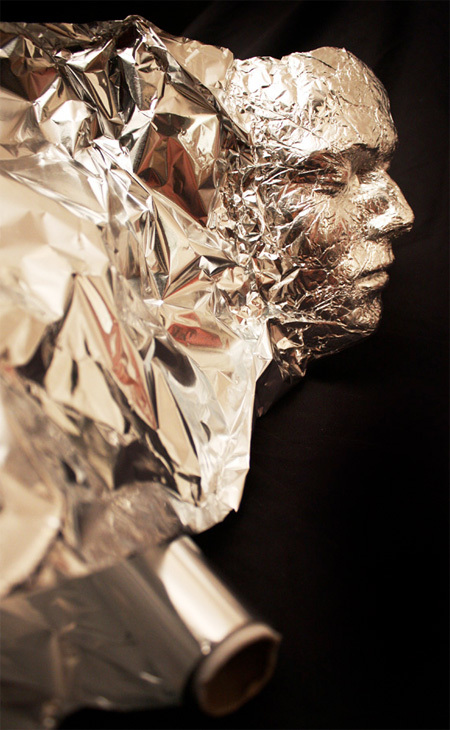 I think I could also recreate this by just pressing tin foil against my own face…no mold needed! WOW! Thank goodness I have a BFA! I recommend you view this in the context of Mr Wilcox’s whole speed creating project before you look down your noses. You may feel not so smug. I went to the artist’s website and literally any of the pieces from the 30 day creation a day spree are more interesting than this. However, I would agree with most of the posters here that it isn’t worthy of an entire Toxel entry. I think that perhaps instead, they should have used either all 30 or at least a wider selection of projects from his creative spree. cool until “forming tin foil into an old plaster mold”. Mark, speed is not at all related to art. Sorry, but the other posters are right. This is not worthy of the site. A 6 year old could manage this ‘project’ and get similar results. Art may be subjective but generally crap is not. I agree, this would be so much more amazing if he made it with his hands, not using a mould. I wonder what the whole body version of this would look like. I assume it would look like a dude covered in tin foil. Just for fun. Do not worry too much. It is a contemporary arts. It is not the difficulty of the art made, it is that he actually thought about it and did it. 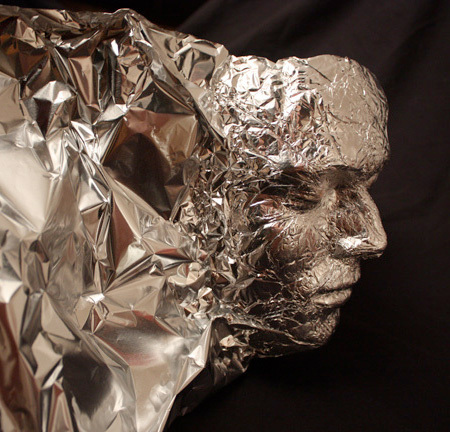 Nice piece of work, silver faces are a great angle for used tin foil. It’s Freebirds art at a higher level. Anyone who likes burritos and knows this place, knows what modhawk is talking about. and next week well use sillyputty and REAL newspapers kids! Reminds me of the good ol’ paper mache! 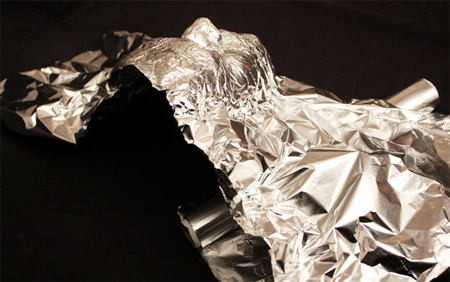 I’ve been wearing thin foil the greater of my life. Even before anyone called it a mask. Which it is NOT! WOW ITS CALLED INSPIRATION PEOPLE HE WILL PUT ANYTHING HE FEELS IS CREATIVE. SO STFU AND GTFO IF YOU DONT LIKE IT. I did this with a 4th grade class using heavy duty foil and the kids own faces–no mold needed. Kids helped each other. When they were done, I spray painted them with a texture paint that looks like stone when it dries. We mounted them to matt boards gluing a piece of sponge under the face so that it looked ‘suspended’ over the matt board. They were well received by the kids and parents and it was fun for all. I truly do not know why a lot of people are so critical of this project – it just shows a particular method, you can do with it as you wish. I wonder if the folks who are so critical are out creating themselves. it is an awesome project for kids! I’m using heavy duty foil right over my grandsons faces! They can put them up on their walls!!! It’s a great idea! I think this project has an interesting and eerie effect. As stated, it’s not always about the difficulty in production. It’s an idea ‘worthy’ of sharing and I’ve seen similar things of absurd ‘simplicity’ on display in well-acclaimed art museums and galleries…and yes, it’s ‘art’. Off your high horses kiddos…nothing wrong with revisiting an art form…even one from younger years.